Kameron Darnel Chancellor (born April 3, 1988) is an American football strong safety for the Seattle Seahawks of the National Football League (NFL). He played college football at Virginia Tech, and was drafted by the Seahawks in the fifth round of the 2010 NFL Draft. He was a member of the team's Legion of Boom unit that defeated the Denver Broncos in Super Bowl XLVIII. For the 2018 season, he announced that his playing career was in jeopardy due to a severe neck injury and sat out the season after not being medically cleared to return. Chancellor was born in Norfolk, Virginia on April 3, 1988 to Karen Lambert. Chancellor's mother always had about two or three jobs all the time and there were five siblings all living together. He never had much money growing up and his family made sure he and his siblings stayed off the street and away from violence. Chancellor attended Matthew Fontaine Maury High School where he played basketball and football as a quarterback and safety for the Commodores athletic teams. As a senior in 2005, he recorded more than 2,000 passing yards and 500 rushing yards and led his team to a 10–2 record and an appearance in the Group AAA Division 5 playoffs. Chancellor was named the team's most valuable player, and he was also placed on the All-Eastern District first team as well as The Virginian-Pilot All-Tidewater second team. Rivals.com assessed him as the 27th-ranked pro-style quarterback prospect in the nation and the 20th-ranked player in the state of Virginia. SuperPrep and The Roanoke Times rated him the 21st-ranked player in the state. The Scout.com recruiting site assessed Chancellor as a two-star recruit and he accepted a scholarship offer from Virginia Tech. "Virginia Tech Football Commitments". Rivals.com. Retrieved November 19, 2016. "2006 Virginia Tech Football Recruiting Commits". Scout.com. Retrieved November 19, 2016. "Scout.com Team Recruiting Rankings". Scout.com. Retrieved November 19, 2016. "2006 Team Ranking". Rivals.com. Retrieved November 19, 2016. Chancellor enrolled at Virginia Tech in 2006 to study human development. He worked out as a quarterback before eventually being moved to the cornerback position prior to the start of the season. He saw action that year as a true freshman in all 13 games, and recorded nine tackles, two broken up passes, and one interception. In 2007, he was moved to the rover position as the starter and also played on special teams. He started in all 14 games and recorded 79 tackles, seven broken-up passes, three quarterback hurries, and one interception as a sophomore. Before the 2008 season, Chancellor was moved to the free safety position, his third position change in three of four years at Virginia Tech. Chancellor started in all 14 games and recorded 52 tackles, of which 27 were solo, two interceptions, five broken-up passes, seven pass deflections, one forced fumble, and two fumble recoveries. After the season, he considered entering the 2009 NFL Draft a year early, but decided to remain at Virginia Tech for his senior season. Before his senior season in 2009, Hokies' defensive backs coach, Torrian Gray said that Chancellor could be "the greatest safety in Virginia Tech history. In his senior season, Chancellor recorded two interceptions, one fumble return, 68 total tackles, three tackles-for-loss, and four broken-up passes. Chancellor has said that he attempts to emulate the former Washington Redskins safety Sean Taylor, and said, "[He was a] big safety, the prototype guy for the position. I'm a big safety, too, and I've just always wanted to be just like him. I don't necessarily say I can be Sean Taylor before it's over, but I think I can be just as good." Also, before games and when he needs motivation, Chancellor says he watched the highlights of Sean Taylor on YouTube. He says it motivated him to do better, strive for greater things, and took him to a darker place which makes him play better. The CBS Sports-affiliated NFL Draft Scout considered Chancellor the third-ranked of the 126 free safeties available for the 2010 NFL Draft and projected him as a third-round selection. The Seattle Seahawks selected Chancellor in the fifth round (133rd overall) of the 2010 NFL Draft. He was the second safety the Seahawks drafted in 2010, behind first round pick Earl Thomas, and was the ninth safety selected overall. On June 2, 2010, the Seattle Seahawks signed Chancellor to a four-year, $2 million contract that includes a signing bonus of $213,000. Throughout training camp, he competed for a job at strong safety against Lawyer Milloy, Kevin Ellison, and Jordan Babineaux. Head coach Pete Carroll named Chancellor the third strong safety on the depth chart to start the regular season, behind veterans Lawyer Milloy and Jordan Babineaux. He made his professional regular season debut in the Seattle Seahawks' season-opening 31-6 victory against the San Francisco 49ers. On September 26, 2010, Chancellor recorded his first career tackle on Darren Sproles after Sproles returned a kickoff for 22-yard and forced a fumble that was recovered by Dexter Davis. He finished their 27–20 victory with two solo tackles and one forced fumble. On October 31, 2010, Chancellor recorded two solo tackles and sacked quarterback Jason Campbell in the Seahawks' 33–3 loss at the Oakland Raiders. The following week, he collected a season-high seven combined tackles (five solo) in a 41–7 loss to the New York Giants. He finished his rookie season with 23 combined tackles (17 solo), a pass deflection, a sack, and a forced fumble in 16 games and 16 starts. Chancellor entered training camp slated as the starting strong safety after the Seahawks opted to not re-sign Lawyer Milloy. Defensive coordinator Gus Bradley officially named him the starting strong safety, alongside free safety Earl Thomas. He started the Seattle Seahawks' season-opener at the San Francisco 49ers and recorded a season-high ten solo tackles in their 33–17 loss. On September 25, 2011, Chancellor collected five combined tackles, two pass deflections, and made his first career interception off a pass attempt by quarterback Kevin Kolb during their 13–10 victory against the Arizona Cardinals. He missed the following game (Week 4), after sustaining a quadriceps injury. On December 24, 2011, Chancellor tied his season-high of ten solo tackles during a 19–17 loss to the San Francisco 49ers. He finished his first season as a starter with 97 combined tackles (75 solo), a career-high 13 pass deflections, four interceptions, and a sack in 15 games and 15 starts. Chancellor ranked second for the Seahawks in both tackles and interceptions. On January 25, 2012, it was announced that Chancellor was added to the 2012 Pro Bowl roster as a replacement for Dashon Goldson of the San Francisco 49ers. Defensive coordinator Gus Bradley retained Chancellor and Thomas as the starting safeties to start the 2012 regular season. On October 17, 2012, he recorded a season-high 11 combined tackles (seven solo) during a 24–23 victory against the New England Patriots. In Week 11, Chancellor tied his season-high with 11 combined tackles (eight solo) in the Seahawks' 28–24 loss at the Detroit Lions. He finished his third season with a career-high 101 combined tackles (75 solo) and four pass deflections in 16 games and 16 starts. On April 22, 2013, the Seattle Seahawks signed Chancellor to a four-year, $28 million contract that included $17 million guaranteed and a $5 million signing bonus. New defensive coordinator Dan Quinn retained Chancellor and Thomas as the starting safeties to begin the regular season. In Week 2, Chancellor recorded five combined tackles, broke up a pass, and intercepted a pass by Colin Kaepernick during the Seahawks' 29–3 victory against the San Francisco 49ers. On December 22, 2013, he collected a season-high 11 combined tackles (six solo), two pass deflections, and an interception as they lost 17–10 to the Arizona Cardinals. He finished the 2013 season with 99 combined tackles (65 solo), six pass, and three interceptions in 16 games and 16 starts. The Seattle Seahawks finished the season atop the NFC West with a 13–3 record and clinched a playoff berth and a first round bye. On January 11, 2014, Chancellor started his first career playoff game and recorded 14 combined tackles (four solo) and two pass deflections during the Seahawks' 23–15 victory against the New Orleans Saints in the NFC Divisional round. The Seahawks defeated the San Francisco 49ers 23–17 in the NFC Championship and went on to Super Bowl XLVIII. 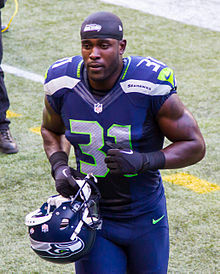 On February 2, 2014, Chancellor made ten combined tackles (six solo), deflected two passes, and intercepted a pass by quarterback Peyton Manning as the Seahawks won Super Bowl XLVIII 43–8 against the Denver Broncos. Chancellor began the season being selected as a team captain by his teammates, along with Russell Wilson, Jon Ryan, and Steven Hauschka. He started the Seattle Seahawks' season-opener against the Green Bay Packers and recorded a season-high 11 combined tackles (eight solo) during a 36-16 victory. On September 21, 2014, in a Super Bowl XLVIII rematch with the Denver Broncos, Chancellor recorded 9 tackles, an interception, a forced fumble, and 2 passes defended in a 26-20 victory, winning the NFC Defensive Player of the Week Award. At the end of the regular season he was selected for the third Pro Bowl of his career and voted in the Second-team All-Pro by the Associated Press. In the Seahawks' Divisional Round game against the Carolina Panthers, Chancellor had a career game in which he recorded nine solo tackles, two assists, and an interception, which was returned 87 yards for a touchdown. It was his third straight postseason game with an interception. Chancellor also vaulted the Panthers' offensive line twice in attempt to block a field goal at the end of the half, though neither attempt counted due to penalties. In the NFC Championship against the Green Bay Packers, Chancellor had four tackles in the 28-22 overtime victory. In Super Bowl XLIX, Chancellor recorded 10 tackles as the Seahawks failed to repeat as Super Bowl champions. They fell to the New England Patriots 28-24. One year into his four-year extension, Chancellor requested a new contract. As of September 14, 2015, there had been no new contract talks between Chancellor and the Seahawks. Chancellor missed the first two games of the 2015 NFL season, a 31-34 overtime loss to the St. Louis Rams and a 17-27 loss to the Green Bay Packers. Chancellor returned to the 0-2 Seahawks in Week 3. The Seahawks went 10-4 since Chancellor's return. For his play in the 2015 season, he earned a trip to the 2016 Pro Bowl. He was ranked 32nd by his fellow players on the NFL Top 100 Players of 2016. In the Wild Card Round of the postseason for the 2015 season, Chancellor would force a fourth quarter fumble of running back Adrian Peterson in a game against the Minnesota Vikings. The Seahawks would recover, and ultimately kick a field goal on the subsequent drive, giving the Seahawks a 10–9 lead, which would end up being the final score of the game after Blair Walsh missed a potential game-winning field goal in the final seconds. The Seahawks went on to lose in the Divisional Round to the eventual NFC Champion Carolina Panthers by a score of 31–24. Starting the 2016 season, Chancellor was named defensive team captain for the second time in his career, joining Russell Wilson, Jon Ryan, and cornerback DeShawn Shead as the four Seahawk captains. In the 2016 season, Chancellor had 47 tackles and two interceptions. The Seahawks would return to the playoffs. In the Wild Card Round victory against the Detroit Lions, Chancellor had six tackles. In the Divisional Round loss to the Atlanta Falcons, Chancellor had six tackles for the second consecutive playoff game. After the season, he was ranked 34th by his fellow players on the NFL Top 100 Players of 2017. On August 1, 2017, Chancellor signed a three-year, $36 million contract extension with $25 million guaranteed with the Seahawks. On November 18, it was revealed that Chancellor would miss the rest of the season after suffering a neck injury in Week 10. He was officially placed on injured reserve on December 16, 2017. Despite missing most of the season with a neck injury Chancellor was named a Pro Bowl alternate at safety. Had he been able to play in the game he would have received the honor. Despite only playing in nine games, he was still ranked 75th by his peers on the NFL Top 100 Players of 2018. In a series of tweets on July 1, 2018, Chancellor said that the neck injury he had suffered in 2017 had not healed enough to allow him to return for the 2018 season. Although he never used the word "retirement," he strongly hinted that it was unlikely he would ever be medically cleared to play again. "To walk away from the game by choice is one thing," he tweeted. "To walk away from the game because of the risk of paralysis is another." Even before then, Carroll had said that Chancellor "would have a hard time playing football again" due to the severity of the injury. He was placed on the team's reserve list, under the physically unable to perform designation, on July 26, 2018. Chancellor remained on the Seahawks roster because his contract called for him to get $6.8 million of guaranteed money in 2018 and a $5.2 million injury guarantee in 2019; he could have potentially forfeited the money had he formally retired. On September 23, 2018, Chancellor had the honor of raising the 12th Man flag for the Seahawks home opener against the Dallas Cowboys, which Bob Condotta of The Seattle Times described as further indication that he would never play a meaningful down again. During a pregame interview with the Seahawks' radio network, Chancellor revealed that he has spinal stenosis and bone spurs in his neck. As a child, Chancellor often visited the Boys and Girls club. His goal is to restore the building to the significance it had for him in the past where there were activities and it was also a safe haven for kids to avoid the violence in the community. With his $34 million contract he signed in 2014 with the Seahawks, he bought his mother a new Lexus and a house, which were things she never had. ^ a b "Kam Chancellor used his NFL money to buy his mom a house". Retrieved May 4, 2015. ^ a b Kam Chancellor, Virginia Tech, retrieved August 7, 2009. ^ Kameron Chancellor Profile, Scout.com, retrieved August 7, 2009. ^ Darryl Slater, Darryl Slater (July 27, 2009). "Tech's Chancellor accepts role as target for offenses". The Richmond Times-Dispatch. Archived from the original on August 20, 2012. Retrieved August 7, 2009. ^ "2008 Season Statistics". Virginia Tech. Retrieved August 7, 2009. ^ "Chancellor tells coaches he'll return". ESPN. January 8, 2009. Retrieved August 7, 2009. ^ Tucker, Kyle (December 31, 2008). "Virginia Tech Hokie weighs his chances at the NFL". Virginian-Pilot. Retrieved May 30, 2016. ^ "Kam Chancellor 2009 Player Statistics - Virginia Tech Hokies". CFBStats. Retrieved July 31, 2017. ^ Randy King (December 30, 2007). "Kam Chancellor's winning style; Hokies rover Kam Chancellor was a big fan of the late Sean Taylor -- a man he tries to emulate". The Roanoke Times. Archived from the original on September 13, 2012. Retrieved August 7, 2009. ^ "Kam Chancellor". nfldraftscout.com. Retrieved August 7, 2009. ^ "NFL Combine: Kam Chancellor". NFL.com. NFL.com. Retrieved September 8, 2015. ^ "NFL Draft Scout Kam Chancellor". NFL Draft Scout. NFL Draft Scout. Retrieved September 8, 2015. ^ a b "Spotrac.com: Kam Chancellor contract". Spotrac.com. Retrieved March 18, 2018. ^ "Bronco Rookie Contracts". milehighreport.com. Retrieved March 18, 2018. ^ Stephens, Derek (June 22, 2010). "City of Second Chances: Seattle Seahawks add Kevin Ellison". bleacherreport.com. Retrieved March 18, 2018. ^ "Ourlads.com: Seattle Seahawks Depth Chart: 09/04/2010". Ourlads.com. Retrieved March 18, 2018. ^ "NFL Game Center: Week 3-2010: San Diego Chargers @ Seattle Seahawks". NFL.com. Retrieved March 18, 2018. ^ "NFL Player stats: Kam Chancellor (2010)". NFL.com. Retrieved March 18, 2018. ^ "NFL Player stats: Kam Chancellor (career)". NFL.com. Retrieved March 18, 2018. ^ "Ourlads.com: Seattle Seahawks Depth Chart: 09/04/2011". Ourlads.com. Retrieved March 18, 2018. ^ Caple, Christian (September 29, 2011). "Seahawks injuries: Kam Chancellor still out with quad injury". seattlepi.com. Retrieved March 18, 2018. ^ a b "Player bio - Kam Chancellor". Seattle Seahawks. Archived from the original on April 1, 2013. Retrieved April 11, 2013. ^ Ryan Christopher DeVault (January 24, 2012). "Two More Seattle Seahawks Make 2012 NFC Pro Bowl Roster: A Fan's Reaction". Yahoo! News. Archived from the original on April 26, 2014. Retrieved January 24, 2012. ^ "NFL Player stats: Kam Chancellor (2012)". NFL.com. Retrieved March 18, 2018. ^ "Kam Chancellor 2012 Game Log". Pro-Football-Reference.com. Retrieved July 31, 2017. ^ Clare Farnsworth (April 22, 2013). "Kam Chancellor signed to contract extension". Retrieved April 22, 2013. ^ "Ourlads.com: Seattle Seahawks Depth Chart: 09/05/2013". Ourlads.com. Retrieved March 18, 2018. ^ "Kam Chancellor 2013 Game Log". Pro-Football-Reference.com. Retrieved July 31, 2017. ^ "NFL Player stats: Kam Chancellor (2013)". NFL.com. Retrieved March 18, 2018. ^ "Super Bowl XLVIII - Seattle Seahawks vs. Denver Broncos - February 2nd, 2014". Pro-Football-Reference.com. Retrieved July 31, 2017. ^ "Kam Chancellor". Seattle Seahawks. Retrieved November 19, 2016. ^ Chris Wesseling (January 2, 2015). "2014 All-Pro Teams". NFL.com. AP. Retrieved January 11, 2015. ^ "Divisional Round - Carolina Panthers at Seattle Seahawks - January 10th, 2015". Pro-Football-Reference.com. Retrieved July 31, 2017. ^ Tim Booth (January 11, 2015). "Wilson and Chancellor Leads Seattle Past Carolina 31-17". ABC News. AP. Retrieved January 12, 2015. ^ "NFC Championship - Green Bay Packers at Seattle Seahawks - January 18th, 2015". Pro-Football-Reference.com. Retrieved July 31, 2017. ^ "Super Bowl XLIX - Seattle Seahawks vs. New England Patriots - February 1st, 2015". Pro-Football-Reference.com. Retrieved July 31, 2017. ^ "Pete Carroll on Kam Chancellor holdout: "He knows where we're coming from, and we know where he's coming from"". SB Nation. Retrieved September 8, 2015. ^ "Seahawks prepare for worst, ready to move on without Kam Chancellor". ESPN. Retrieved September 8, 2015. ^ "Kam Chancellor 2015 Game Log". Pro-Football-Reference.com. Retrieved July 31, 2017. ^ "'Top 100 Players of 2016': No. 32 Kam Chancellor". NFL.com. ^ "Wild Card - Seattle Seahawks at Minnesota Vikings - January 10th, 2016". Pro-Football-Reference.com. Retrieved July 31, 2017. ^ "Divisional Round - Seattle Seahawks at Carolina Panthers - January 17th, 2016". Pro-Football-Reference.com. Retrieved July 31, 2017. ^ "Russell Wilson, Kam Chancellor among Seahawks' four captains". ESPN.com. Retrieved July 31, 2017. ^ "Kam Chancellor 2016 Game Log". Pro-Football-Reference.com. Retrieved July 31, 2017. ^ "Wild Card - Detroit Lions at Seattle Seahawks - January 7th, 2017". Pro-Football-Reference.com. Retrieved July 31, 2017. ^ "Divisional Round - Seattle Seahawks at Atlanta Falcons - January 14th, 2017". Pro-Football-Reference.com. Retrieved July 31, 2017. ^ "'Top 100 Players of 2017': No. 34 Kam Chancellor". NFL.com. Retrieved July 31, 2017. ^ Orr, Conor (August 1, 2017). "Kam Chancellor signs 3-year extension with Seahawks". NFL.com. ^ "Kam Chancellor expected to miss rest of 2017 season". NFL. Retrieved November 18, 2017. ^ Drovetto, Tony (December 16, 2017). "Seahawks Make Roster Moves". Seahawks.com. Archived from the original on February 24, 2018. ^ Boyle, John (December 19, 2017). "Four Seahawks Earn Pro Bowl Honors". Seahawks.com. Archived from the original on February 5, 2018. ^ "Citing injury, Seahawks safety Kam Chancellor seems to announce retirement on Twitter". ESPN. Retrieved July 2, 2018. ^ "Kam Chancellor believes he's played his last game". NFL.com. July 1, 2018. ^ "Seahawks Safety Kam Chancellor Placed On Reserve/PUP List". Seahawks.com. July 26, 2018. ^ Bob Condotta (September 24, 2018). "Seahawks safety Kam Chancellor raises 12th man flag, reveals he has spinal stenosis". The Seattle Times. ^ a b "Kam Chancellor Stats". PFR.com. Retrieved February 2, 2015. ^ "HUMBLE BEGINNINGS - Kam Chancellor survived childhood in a rough Norfolk neighborhood and wants to help young kids there do the same". hokiesports.com. Retrieved May 4, 2015.